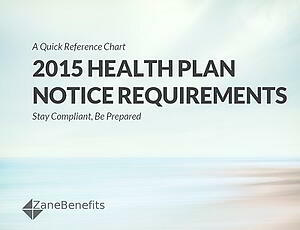 Zane Benefits, the leader in individual health insurance reimbursement for small businesses, announced today the publication of a new eBook, "2015 Health Plan Notice Requirements." The quick reference chart helps employers properly administer health benefits in 2015 and stay compliant. When a company offers a group health plan there are several different notices employers are required to provide to participants and beneficiaries. According to Zane Benefits, keeping track of the required notice requirements under ERISA, HIPAA, COBRA, and the Affordable Care Act can be tedious and time-consuming. However, failure to comply with these notice requirements can lead to costly fees and penalties. The new quick reference chart summarizes health plan notice requirements for employers offering different types of group health plans including fully-insured and self-insured group health insurance plans and defined contribution health plans (ex: Healthcare Reimbursement Plans).